Improve SEO, the power of content curation - download the free eBook! Learn why and how content curation is your best bet to increase your SEO rankings. Want to improve SEO? Then STOP doing SEO! That's right! The old SEO is dead. Backlinks-only strategies are not only inefficient but now condemned by search engines. The only way to improve SEO now is to understand the new SEO: content marketing. - Why the rules have changed and content is the new SEO. 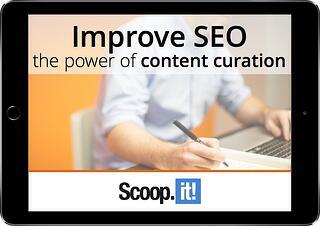 - How content curation helps you improve SEO. - Content curation for SEO: data-driven answers. - 15 tips to leverage content curation to improve your rankings, increase your traffic and generate more leads.